Bridge for Health’s latest news! 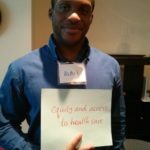 Bridge for Health Coop Launch Event! We are happy to announce that we will be hosting the launch of our new Coop Association in Vancouver on Wednesday September 28th, 2016! We have a very special evening lined up including a talk with renowned author and best seller Dr. Gabor Maté! Tickets are going fast and seats are limited so make sure you purchase your ticket today! Click HERE for latest newsletter for an update on our events and news. Bridge for Health is a proud partner of this event! CHARLOTTETOWN, June 13, 2016 /CNW/ – The 6th Global Forum on Health Promotion, October 16-17 in Charlottetown, Prince Edward Island, Canada, will highlight the strategies and achievements of communities, organizations and health promotion leaders working locally to achieve global impact. Organized by a team of international and Canadian health promotion organizations, including the Alliance for Health Promotion (Geneva), The Quaich (Charlottetown) and Groupe entreprises en santé (Montreal), the theme of the 6th Global Forum is Health Promotion ~ At the Very Heart of Sustainability. Central to the 6th Global Forum’s programming are the five principles of the Ottawa Charter, which celebrates its 30th anniversary this year, and the United Nations Sustainable Development Goals. In 2015, world leaders at the UN Sustainable Development Summit adopted the 17 Sustainable Development Goals to end poverty, fight inequality and injustice, and tackle climate change by 2030. Although 15 years is a short time to achieve these goals, huge strides are being made through civil society initiatives in health promotion. And the impact is both local and global. Preliminary program highlights include keynote speaker Zsuzsanna Jakab from WHO Europe, as well as invited speakers who are trailblazers in the field of health promotion. Participants will take part in the creation of the PEI Declaration, a declaration calling for increased investment in health promotion to be submitted to the WHO’s 9th Global Conference on Health Promotion in Shanghai in November. The 6th Global Forum is an initiative of the Alliance for Health Promotion, an NGO in official relations with the WHO that works to bridge the gap between international declarations and local realities. This is the first time the event is being held outside of Europe, and the Alliance is thrilled to be hosted by the Government of Prince Edward Island for the occasion, with PEI’s Department of Health and Wellness as an official sponsor. To learn more about the Forum and to register, visit www.globalforumpei-forummondialipe.com. Early bird rates and student rates are available until June 30. Bridge for Health is piloting the Healthy Business Practice Framework to support the design of healthy workplaces, using systems thinking and a rapid prototyping model to spark some creativity to identify common wellbeing/health challenges and solutions in the workplace setting. In partnership with Simon Fraser University-Faculty of Health Sciences, we are pleased to invite you to join us for an interactive workshop with Surrey Board of Trade to explore the barriers and opportunities faced by small businesses in BC. Join us at our next event in Surrey on June 21, 2016! 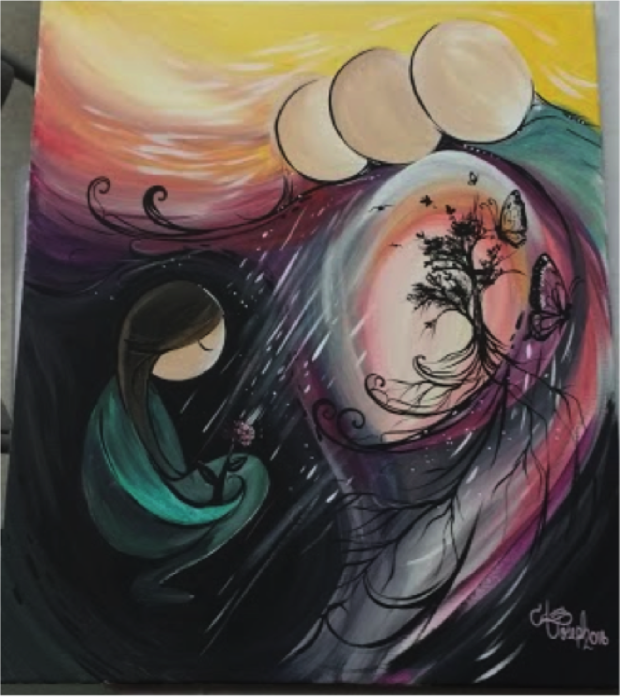 Click here our March 2016 newsletter! 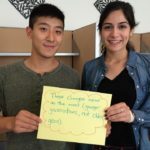 Bridge for Health created the #EngagewithWHO social media campaign in September 2015 to hear voices from young people on how they would like to participate in global health policy development. Bridge for Health Nov 2015 News! Click here to get the latest newsletter with exciting updates about our youth engagement report, upcoming local events and more! On October 2016, the World Health Organization (WHO) will hold their 9th Annual Global Conference on Health Promotion in China on November 21-25, 2016. Some of the most influential decision makers of today will be invited to attend this conference which focuses on: cities and human settlements, action across sectors, social mobilization, and health literacy. 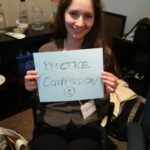 Bridge for Health is submitting a briefing report to the conference scientific committee on how to best incorporate youth engagement within these topics, and the conference itself. Bridge for Health hopes to encourage an increased participation and collaboration among youth and the decision makers of today. We recognize the value of engaging youth within this transformative conversation about the conditions required for a healthy and sustainable future. It is rare to find youth, our future world leaders, seated among today’s decision makers. We hope to change that. We are calling for your help in support of this mission. Until the end of September 2015, you can help give youth a voice through your (or your organization’s) social media platforms. We are asking you to lend your support and participate in Bridge for Health’s social media campaign #engagewithWHO that will launch the first week of September and run throughout the month. Together, we can use established social media platforms, and reach a wide range of youth. Hearing the real-life opinions of youth is integral to promote citizen engagement towards health for all. To support #engagewithWHO campaign, please follow Bridge for Health on Facebook, Twitter, and Instagram (Bridge4Health). 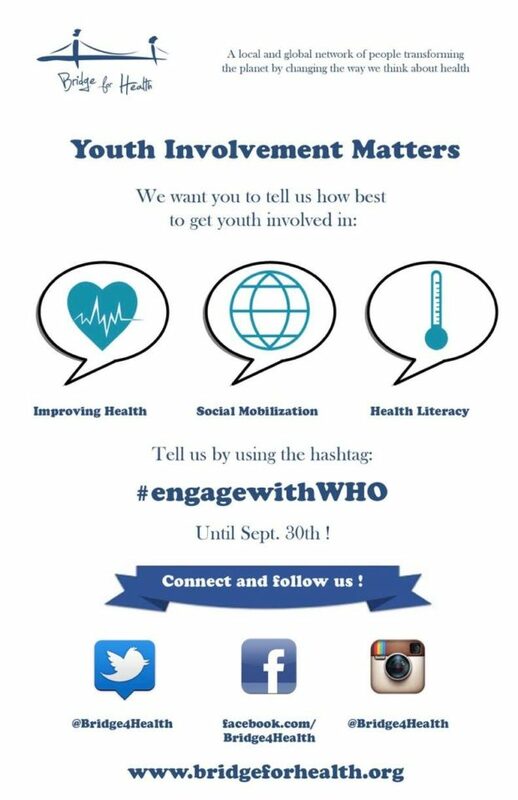 Each week, you will be asked to repost, retween, and/or regram a question regarding youth engagement/heath literacy and be sure to use the hashtag #engagewithWHO. By encouraging youth to share their thoughts and ideas, we are hoping to increase youth involvement in global conversations related to health. All responses will be used to inform and encourage youth engagement at WHO’s 9th Global World conference on Health Promotion. Bridge for Health is pleased to be an organizing partner for a public forum on May 25th at 7:00 pm on Prevention of Violence.This event is free of charge and open to the public, please share among your networks, colleagues and friends. We request to register online at https://violencepreventiontownhall.eventbrite.com, seats are limited. The forum will take place at Hyatt Downtown Hotel in Vancouver at the Regency ballroom on the third floor.